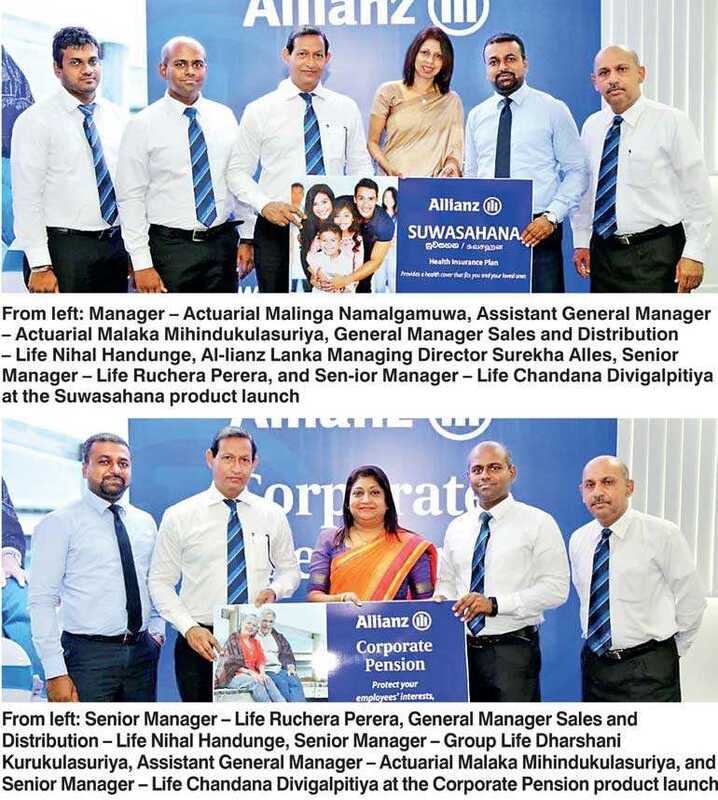 Allianz Lanka recently announced the launch of two new unique products that will create greater value for their customers. These are the Allianz ‘Suwasahana’ and ‘Corporate Pension’ plans which incorporate a level of convenience and customisation that will transform the way people look at and conceive insurance products in the future. The Suwasahana health plan creates a tailor-made solution to fit the needs of the customer and their family. Suwasahana comes in as a standalone protection plan that provides insurance coverage for hospitalisation and in the unfortunate event of death. As a result of this unique combination the premiums paid by the customers are highlyaffordable when compared to similar products in the market. Incorporating evengreater flexibility to their product Allianz allows the customer to add on additional covers to their policy if they should deem it necessary. Furthermore, the policy grants customers access to the Allianz Virtual Doctor – a special value added service only offered by Allianz. The Virtual Doctor is a special facility provided to Allianz policyholders, through which they get access to the best possible medical expertise in the world, without the need to travel anywhere. The facilityincludes confirmation of diagnosis, evaluation of cases where a diagnosis is not yet possible, advice on the best course of treatment, and follow-up on a case reported previously without any other limitations to the policyholder.This will allow policyholders to receive a documented medical opinion on a complex, grave or critical illness diagnosis directly from the panel of specialists working in world class medical institutions.Allianz’s Corporate Pension plan, however, is aimed at companies and entrepreneurs who wish to provide their employees with an attractive benefit package.This product is the first of its kind in Sri Lanka that provides a comprehensive pension solution exclusively for corporates. Special benefits of the policy include very low and transparent charges unmatchable with existing individual insurance products in the market, flexibility of premium contributions from both the employer and employee, the ability to check individual pension account balance at any given time, and the ability for the employee to continue the policy if they complete a pre-agreed number of years of service to the company. This revolutionary product serves the dual purpose of providing employees with a comprehensive pension solution as well as help the company attract and retain talent.